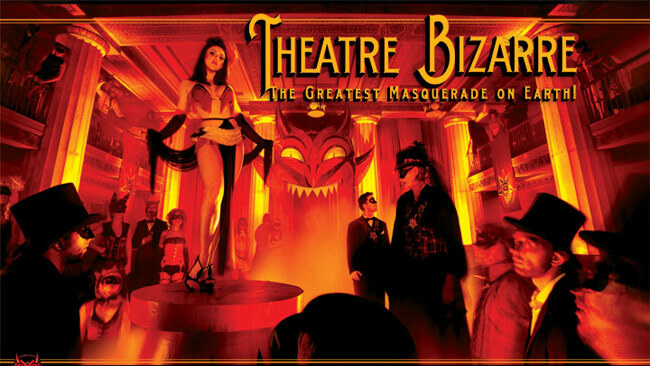 Theatre Bizarre is a unique, immersive and truly spectacular annual production which seems to become more fantastical and thrilling every year. 21st Century Burlesque Magazine reached out to the 2013 cast of Theatre Bizarre: The Procession, and the passionate response tells you all you need to know about an unforgettable experience for performers and audiences alike. 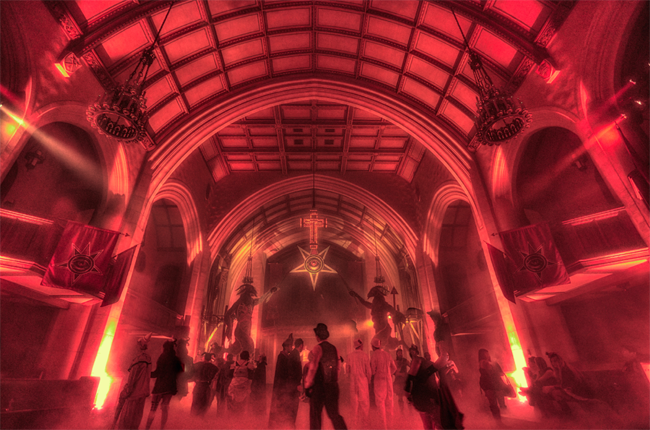 The cold and imposing shadow cast by Detroit’s historic Masonic Temple battles the heat being generated by the thousands of masqueraded revellers inside its cavernous frame. Warm light from hundreds of candles seeps into the darkness, and the darkness pushes back, sometimes palpably as doors swing shut, untouched. It’s a dance that goes on all night. Just like Theatre Bizarre. The backstage of the Dirty Devils Peepshow starts off with familiar sights and sounds. Bags being rolled in by jetlagged but game performers. Ladies stake out spots in front of ill-lit mirrors. High-pitched squeals of greetings between those who haven’t seen in each other in months or longer. Cheery hugs between those meeting for the first time. Then it begins to change. Glamorous costumes are paired with terrifying makeup as nightmares and wet dreams collide. Evil dolls in tight corsets. Blindfolded muses in bejewelled merkins. Betty Page covered in bugs. Pinhead and Hatchetface are here, debating which one looks uglier while they pull on stockings and test their pasties. The night is about to begin. 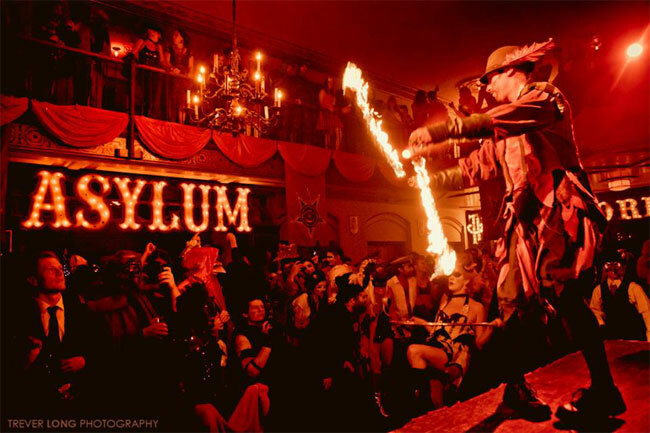 Satan’s gaping maw is the entrance to the stage, itself a runway, a tongue licking out into the costumed throngs of titillated patrons. The emcee oozes onstage and the audience cranes their necks to see. Their throats are exposed, and so one after another the performers move in for the kill. They’re not seeking blood but applause, and they get enough to drown in. The room is awash in hot breath, yellow stage lights, smoke effects and an unending buzz of excitement. As each set ends, the crowd flows out, replaced by another. Each group populated by countless woodland fairies, zombie brides, mustachioed strongmen, lords and ladies, construction workers and pixie-haired twerkers. There is not a costume one could imagine that is not somewhere on the grounds of this magnificent building. The lights dim and Satan once again spits forth his demon emcee, who unleashes the succubae upon the willing supplicants. Bodies sparkle, eyes twinkle, pasties twirl, fringe lashes out and lashes fringe out. 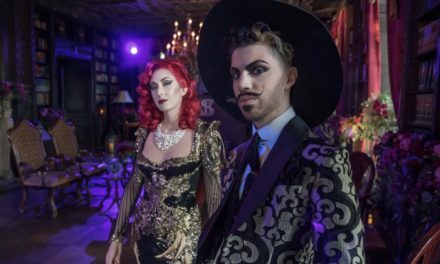 I saw the art come to life on Friday night at Theatre Bizarre’s Procession Preview Gala. This night’s celebration was a masquerade, and so I got all fancied up, put my mask on and went downstairs to the Crystal Ballroom not knowing what to expect. Upon arriving, I heard great big band swing, saw people dancing and drinking, and I couldn’t wait to join the dance floor. I didn’t even take time to look for a partner. I just went out and started solo dancing. Soon I was introduced to some swing dancers that had started dancing about the same time as me. We had similar styles and were able to connect quickly on the dance floor. It felt great to magically find great music and great dancing come together in this strange, beautifully spooky setting. By the time it was time for me to take the stage I was all jazzed up and energised. I had a great set and was truly honoured to be in this setting with all the other performers and artists that were all there in the room. Soon after, we paraded away in the company of a New Orleans style marching band and went upstairs to continue the party. It was the beginning of an amazing weekend filled with incredible works of art, talented performers and an amazing crowd of joyous party-goers. It was a crazy world to be a part of, and I can’t wait to return! Hail Zombo! Have you ever had a fever dream that infiltrates all parts of your mind and waking life only to realise you weren’t asleep in the first place? It is a struggle to find the best words to fully describe the mania, flush, and almost hallucinatory qualities of Theatre Bizarre. 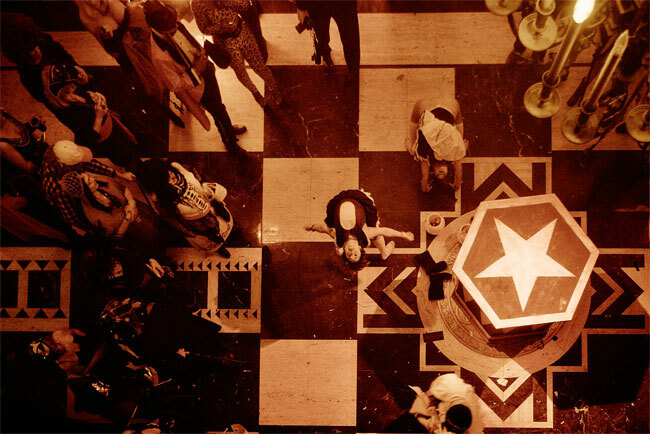 The show took place at the 100 year old Masonic Temple in Detroit, not only the largest masonic temple in the world but also one of the most imposing and fascinating buildings I’ve ever set foot in. Apparently, women were only allowed in the building ten years ago. I had a feeling we dancers were going to be presenting quite a challenge to the vestigial energies that lay dormant (or not) in the building. When we arrived at the building at last, I felt simultaneously amazed and completely terrified. Upon entering the Greek temple-themed room we were to perform in, our driver gleefully pointed out the rectangular-shaped indentation in the carpet, saying that there was a coffin space underneath there used for a Masonic initiation ceremony. Oof. 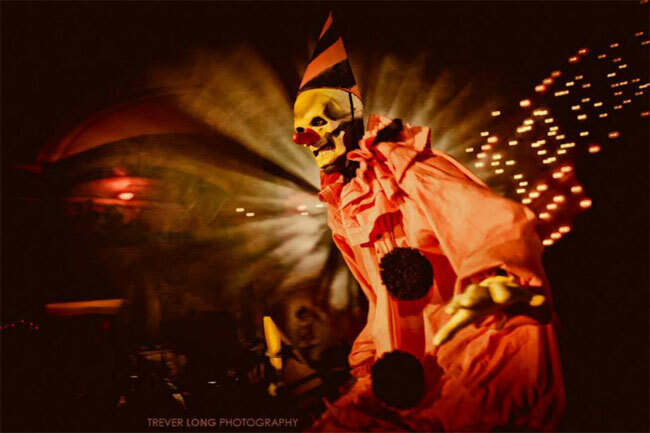 I couldn’t tell if Zombo the Clown, the presiding deity that oversees Theatre Bizarre, had joined forces with the spirits of the masons, but there was some serious juju in the air that I couldn’t quite put my finger on. As the night unfolded, I could feel the waves of enthusiasm, excitement and anticipation coming from the crowd both onstage and off. The mood of the whole party was unlike anything I’ve ever experienced. Absolutely everyone was there for a wild night and, boy, did the party deliver. June 1st cutoff for Lane, Sideshow and Music Acts.